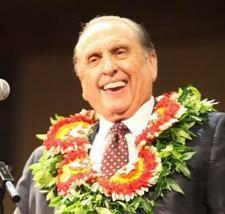 President Monson's 90th birthday this year coincided with a total solar eclipse over the United States. But the sky wasn't the only one to celebrate the occasion. Hundreds gathered outside of President Monson's apartment to sing "Happy Birthday" to our beloved prophet. According to Al Fox Carraway, President Monson even looked out of his apartment window and waved to the crowd.